Is It Good? 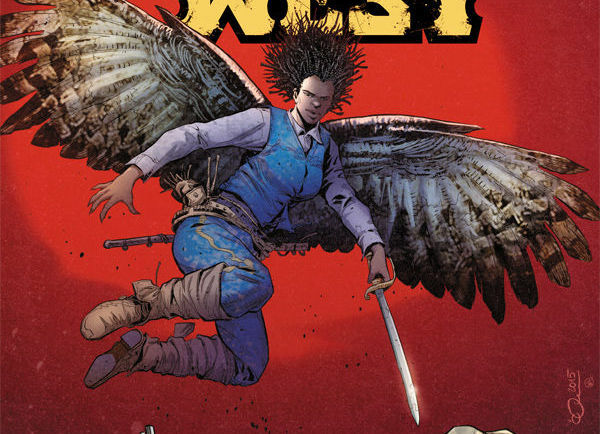 Kingsway West #2 Review – AiPT! The American western gets flipped on its head as China, Mexico, and New York are at war, a red substance powers vast and amazing machines, and even dragons exist. We weren’t huge fans of the first issue, but how is issue #2? Is it good? In an Old West overrun with magic, the Chinese outlaw Kingsway Law rides toward the town of Rio Chino to reunite with his wife. But can he escape a winged and dangerous Buffalo Soldier scout named Strode and the Engineer’s monstrous posse? Meanwhile, a swordswoman named Ah Toy seeks Kingsway’s help, but every step in the wrong direction is a step further from his love. You can’t deny that when Greg Pak writes something you listen. The man gave us World War Hulk after all, as well as the amazing Planet Hulk. Artist Mirko Colak may be relatively unknown, but he draws visceral monsters and magic. You were a bad bad man. This issue opens with a flashback, which is a sign that we might be doing this more often than not considering how much the first issue jumped around in time. That is a good thing, however, as the opening pages reveal the love our protagonist had for his wife/, which was a major thing lacking in the first issue. It’s what is driving him after all, and it does well to establish what he’s willing to do (and go back to his violent ways) to get her back. The issue characterizes Kingsway well with opportune flashbacks to the days when he was a killer (and maybe a racist too), which he regrets. The pain he feels when flashing back makes him sympathetic and solidifies the reluctant hero angle. Pak is clearly showing us how you can’t just avoid war and when it’s necessary we need heroes to rise up and face the bad things instead of ignoring them. The world is fleshing out too and Mirko Colak does a good job showing us its underbelly. Plus there are giant rabbits, and people riding them with techno-mounts! They don’t look silly in the slightest, but very cool which is tricky to pull off I’m sure. The art in general has a pulpy feel to it and the dusty western vibe is felt throughout (check out the neat whispy smoke in the page below). There’s also a fantastic full page spread of Kingsway and his wife kissing with dragons flying about and monsters on a foreboding cliff that in one fell swoop shows us how love can exist in a world of magic and monsters. I still can’t shake the feeling that we’ve been dropped too harshly into this world. It makes the experience an on-the-job learning experience, which hurts your ability to understand the context of situations, let alone the world at large. This is a far better issue than the first, as it helps establish Kingsway’s state of mind but also the man he used to be. Plus the magical elements of the world pop up much more here too.